A cross-pollination of religious influences in pre-Islamic Arabia resulted in a budding monotheistic tradition and conception of prophethood. This article explores a series of Arab monotheists that lived before and during the mission of the Prophet Muhammad. Islamic literature presents the former group as forerunners to the Islamic Prophet, and the latter group as rivals and imitators. The Arabs in the seventh century were no strangers to monotheism or prophethood. They shared their peninsula with significant Jewish communities in Yemen and Yathrib, Christian communities in Najran, Abyssinia, and the Levant, and other monotheists like the Raḥmānīyya A monotheistic trend that appeared in South Arabia in the 4th century.in South Arabia and the Ḥanīfiyya Arabs who rejected idolatry and claimed to have been upon the religion of Abraham and Ishmael.in Mecca. Prior to the ministry of the Prophet, the Quraysh would practice taḥannuth, which was to avoid the idols and sojourn away from city life. The Quraysh also acknowledged Abraham and Ishmael as their patriarchs, despite being neither Christian nor Jewish. With this in mind, it should be no surprise to students of history that there were other callers to monotheism in the lifetime of the Prophet Muhammad. These preachers relied on their poetic rhetoric, charisma, and claim to knowledge to etch a permanent place in Islamic history. They can be divided into two categories: (1) Harbingers, who are presented in Islamic literatures as forerunners heralding the coming of the Prophet. (2) Those presented as rivals to the claim and authority of the Prophet. It is not known when exactly Khālid b. Sinān lived, but he is revered in the Islamic tradition as an Arab quasi-prophet that came before Muhammad. While some Muslim exegetes claim, based on 5:19 of the Quran, that there were no prophets in the interval (fatra) between Jesus and Muhammad, Qurṭubī and Zamakhsharī list Khālid b. Sinān as a minor prophet sent to the Arabs. His family name, al-ʿAbsī, implies that he came from the ʿAbs tribe, who are Arabized descendants of ʿAdnān, the patriarch of Ishmaelite Arabs. Sometimes he is identified as the prophet sent to the people of al-Rass, who are mentioned very briefly in the Quran. He also appears in a list of revered figures in a supplication attributed to Jāʿfar as-Ṣādiq. Khālid b. Sinān is presented as a sort of heroic figure who miraculously extinguishes an inferno and kills a terrifying winged-creature. Ibn Quṭayba and Ibn ʿAbd al-Ḥakam quote a tradition from the Prophet Muhammad saying that Khālid b. Sinān was “a prophet whose people had neglected” – but the exact meaning of this is unclear. Majlisī details a tradition in which the Prophet Muhammad greeted Khālid’s daughter, honoured her, and mentioned that he was a prophet rejected and killed by his community. Unlike other harbingers, who, in the literature, foretell the coming of the Prophet, Khālid b. Sinān is respected by the Prophet in retrospect. This homage could be a nod to a monotheistic tradition practiced in pre-Islamic Arabia. An Arab preacher of monotheism whom the Prophet Muhammad probably witnessed in the late sixth century was Qus b. Sāʿida al-Iyādī. Qus was an eloquent orator who made a lasting impact on the Arabs. He was either a Christian bishop from Najran, or a Hanīf. Suyūṭī says that Qus was the first person to use the phrase “as for what comes after” (ammā baʿd), which became an integral part of Friday sermons in Islam. Qus was best known for a poetic speech he gave at the ʿUkāth market near Ta’if. ʿUkāth, which was the largest souq in pre-Islamic Arabia, was where Arab leaders would compete in reciting poetry, narrating stories and sharing wisdom. The best poems were hung at the Kaʿba. The speech in question was one narrated by the Prophet himself,   and it begs the listener’s attention, speaks of the sober reality of death, and alludes to the coming of a prophet. Qus b. Sāʿida says, “And a prophet of God will come; and his coming is near. His shadow hovers over your heads. Blessings to him who believes in the prophet and basks in the light of guidance. Woe to him, who rebels and opposes him!” Sadūq’s version does not contain this prophecy; and it also implies that Qus died just before the Conquest of Mecca, but this is unlikely. Perhaps the most fascinating forerunner to the Prophet was Zayd b. ʿAmr b. Nufayl, who lived shortly before the call to Islam. He was a Meccan from the tribe of ʿAdi A clan of the Quraysh tribe descended from ʿAdiA clan of the Quraysh tribe descended from ʿAdi b. Kaʿb. b. Kaʿb.who had gone to the Levant in search of the true religion. When he became dissatisfied with the answers of the Jews and the Christians there, he declared that he was upon the religion of Abraham. From Bukhārī’s account, it would seem that Zayd b. ʿAmr did not know what a Hanīf was prior to his discourses in the Levant. Whether that would make him the first Hanīf, in Mecca or in the world, is unclear. This fact may also strengthen the idea that Qus b. Sāʿida was a Christian and not a Hanīf. Zayd b. ʿAmr would stand with his back against the Kaʿba in Jahiliyya, saying, “O people of Quraysh! By Allah, none amongst you is on the religion of Abraham except me.” He would rescue girls from being killed by their fathers and provide for them – echoing the phenomenon highlighted in 81:8-9 of the Quran. As a fellow Meccan in the early seventh century, Muhammad would have known Zayd b. ʿAmr. In one report, Muhammad was sitting with Zayd b. ʿAmr when the latter refused a dish containing meat sacrificed to the idols. Zayd b. ʿAmr even composed poetry renouncing the Qurayshi goddesses in the strongest of terms. ʿAdi A clan of the Quraysh tribe descended from ʿAdiA clan of the Quraysh tribe descended from ʿAdi b. Kaʿb. b. Kaʿb.is the clan of ʿUmar b. al-Khattāb. His father, al-Khattāb, would reproach Zayd b. ʿAmr for forsaking the religion of his people. Al-Khattāb would harass him, instructing the urchins of Mecca to do the same, until he was forced to live in the northern outskirts of the city. Zayd retreated to Mount Ḥirā – the location of Prophet Muhammad’s first revelation – and continued to make trips to the Levant and Iraq. According to Ibn Iṣḥāq, he met a Christian monk in Jordan, who spoke of “a prophet who will come forth from your own country … he will be sent with the Ḥanīfiyya, the religion of Abraham, so stick to it, for he is about to be sent now and this is his time.” The function of Zayd b. ʿAmr in Islamic literature may be both to demonstrate the expectation of a prophet and the intuitive logic of monotheism. Zayd b. ʿAmr was murdered in Lakhmid An Arab kingdom of southern Iraq and eastern Arabia.territory, but it is unclear who killed him and why. He may have been killed by his rival al-Khattāb and his acolytes. However, we must consider the possibility that Zayd, who was outspoken in Mecca, and who debated rabbis and monks elsewhere, ran into trouble with Lakhmid An Arab kingdom of southern Iraq and eastern Arabia.pagans or Christians. Waraqa b. Nawfal, the Christian cousin of Khadīja, composed an elegy in praise of his abandonment of idolatry. The son of Zayd was Saʿīd b. Zayd, the companion of the Prophet Muhammad. He was married to Fāṭima bt. al-Khattāb, the sister of ʿUmar. When ʿUmar first heard the Quran being recited at their house, he beat them bloody before accepting Islam himself. Since Zayd b. ʿAmr faced similar persecution from al-Khattāb, it is possible that this episode was a continuation of this policy. However, it is noteworthy that much of the surviving accounts of Zayd b. ʿAmr’s life were narrated through ʿAbdullāh b. ʿUmar; perhaps due to their kinship. Finally, there was Waraqa b. Nawfal, who is said to have studied the scriptures. In Ibn Iṣḥāq’s biography, it is reported that shortly after Muhammad married Khadīja, he set forth to do business in Syria. There, an unnamed monk recognized him as a prophet; and Khadīja’s servant witnessed two angels shading him from the Sun. When Khadīja was informed of this, she spoke to Waraqa, who reportedly said, “If this is true, Khadīja, verily Muhammad is the prophet of this people. I knew that a prophet of this people was to be expected. His time has come.” This means that Waraqa may have already identified Muhammad as a prophet over a decade before his first revelation. With the attribution of miracles before his ministry, academics should consider the possibility that Muhammad’s prophetic mission began before his famous experience at Ḥirā. According to Ibn Iṣḥāq and a narration from ʿĀ’ishā, Waraqa b. Nawfal described the Prophet Muhammad’s first revelation as the same law (nāmūs) that God sent to Moses. The comparison to Moses may be a subtle reference to Deuteronomy 18:18, in which God tells the Israelites of a prophet like unto Moses. Waraqa was, after all, learned in the Torah. Waraqa passed away in the early days of Muhammad’s mission. There is record of some individuals who claimed prophethood and preached monotheism in Arabia during the ministry of the Prophet Muhammad. One such person was Umayya b. Abī’l Salṭ, a poet and preacher from Ta’if. He visited Jewish and Christian clergymen in Syria and read in the scriptures that a prophet would be sent from among the Arabs. He hoped that he would be this prophet, upon the religion of Abraham and Ishmael. Umayya’s poetry glorified the one God, described the heavens and the Earth, narrated the story of Thamūd, and relayed prophetic stories. Umayya also claimed to have had his chest opened and filled with inspiration, similar to how some reports indicate that the Prophet Muhammad’s chest was opened by Gabriel as a child. Ibn ʿAsākir relates a report from Zūhrī that Umayya b. Abī’l Salṭ went to Mecca to meet the Prophet Muhammad. Umayya recited his poetry, and when he finished, Muhammad recited Surah Yasīn. Umayya bore witness to the Quraysh that Muhammad’s message was true, but when he was asked if he would follow Muhammad, Umayya said that he would need to investigate him further. According to the same report, he accepted Islam after Badr, and then left Islam after returning to Ta’if. It is implied by Masʿūdī that he rejected the Prophet out of jealousy. Upon his death, Umayya b. Abī’l Salṭ purportedly said, “I know that the Ḥanīfiyya Arabs who rejected idolatry and claimed to have been upon the religion of Abraham and Ishmael.is the truth, however I am in doubt regarding Muhammad.” Umayya’s inclusion in Islamic literature highlights a belief in monotheism and an expected prophet, as well as a subtle warning against those who vie to be more than what God has made them. One of the most perplexing characters in Islamic history is Ibn Ṣayyād. Ibn Ṣayyād was a Jewish boy from Medina who claimed to be the messenger of God (perhaps to the Jews), while claiming that Muhammad was the messenger of God to the gentiles. The latter claim would seem typical of a Jew of that era who had trouble accepting an Arab prophet. Bukhārī and others narrate an exchange between Muhammad and Ibn Ṣayyād in which they challenged one another on their knowledge of the occult. The narration depicts a gridlock in which neither candidate is given the upper hand. It is noteworthy that the traditions on him are mainly transmitted through ʿUmar b. al-Khattāb, his son ʿAbdullāh and his daughter Hafṣa. They seemingly believed that Ibn Ṣayyād was the Antichrist;  causing ʿUmar to want to behead him and causing ʿAbdullāh b. ʿUmar to rouse him in Medina. Ibn Ṣayyād reportedly embraced Islam, but it is unclear what happened to him thereafter. Ṭabarī relates a tradition in which Ibn Ṣayyād was at the siege of Sūs, where monks taunted the Muslims, saying that they would not be able to conquer the town unless the Antichrist were with them. Thereupon, Ibn Ṣayyād called upon the town gates to open, and they did. Abu Dawūd records that Ibn Ṣayyād was “lost” when Yazīd waged war on Medina in 63 AH. Both of these accounts fit into the theme that presents Ibn Ṣayyād as an enigmatic and problematic figure. Cook argues that the disappearance of Ibn Ṣayyād at seventy years of age may have apocalyptic implications, with seventy being a ripe age to enter occultation. In one report, the Jews of Isfahan celebrated Ibn Ṣayyād as their king; implying that the Antichrist would be the king of the Jews. In another narration, Ibn Ṣayyād denied being the Antichrist whilst claiming to know the Antichrist’s true location. Further traditions indicate that Ibn Ṣayyād was born circumcised, grew faster than ordinary children, and had a heart that never slept. This last point may be a reference to 5:2 of the Song of Solomon: “I slept, but my heart was awake” – meaning, he remained attentive even when asleep. These motifs are normally reserved for prophets and saints in the Islamic tradition. Their attribution to Ibn Ṣayyād imply that he was a parody prophet or anti-prophet; a perfect rival to the Prophet Muhammad and a precursor to the apocalyptic Antichrist. In conclusion, the Prophet Muhammad came to an atmosphere that was developing an understanding of monotheism and prophethood and rediscovering its Abrahamic roots. While Zayd b. ʿAmr was persecuted for his beliefs, it is interesting that Khālid b. Sinān, Qus b. Sāʿida, Waraqa b. Nawfal, and Umayya b. Abī’l Salṭ were apparently left to their own devices. One wonders why the Arabs perceived Muhammad to be more dangerous than his precursors and rivals – was he able to generate more momentum, or was his claim simply the last straw? The complexity of tribal alliances is a further web that needs to be untangled to answer these questions. Further research can be done on the ridda prophets Musaylama, Sajā, and Ṭulayḥa, who are often depicted as imitators who gained momentum during the confusion after the Prophet Muhammad’s life and succession. Musaylama, a sage from eastern Arabia, was indeed active during the lifetime of the Prophet; and the claim of Sajā, an Arab Christian who declared herself a prophetess, would be a good case study for analysing gender in seventh century Arabian religion. M.J. Kister, “Al-Tahannuth”: An Inquiry into the Meaning of a Term, Bulletin of the School of Oriental and African Studies, Vol. 31, pp. 223-224. Seyyed Hossein Nasr, The Study Quran, HarperOne, pp. 286. Gerald Hawting, “Were there prophets in Jahiliyya?”, Islam and its Past: Jahiliyya, Late Antiquity, and the Qur’an, Oxford University Press, pp. 200-201. Riad Kassis, The Book of Proverbs and Arab Proverbial Works, Brill, pp. 127. Suyuti, al-Mazhar Fii `Ulum al-Lugha wa Anwa`aha, Vol. 1, pp. 396. Rami Touqan, The Introduction of Ibn Khaldun, Dar Al-Kotob Al-Ilmiyah, pp. 746. Hamilton A.R. Gibb, “Pre-Islamic Monotheism in Arabia”, The Arabs and Arabia on the Eve of Islam, pp. 304. 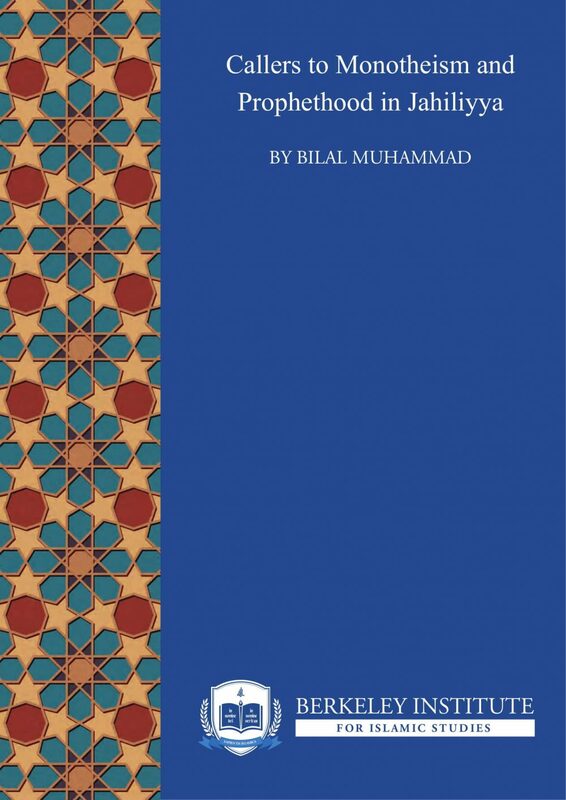 Osman Nuri Topbas, The Prophet Muhammad Mustafa the Elect, Erkam Publications, pp. 139. Alfred Guillaume, The Life of Muhammad: A translation of Ibn Ishaq’s Sirat Rasul Allah, Oxford University Press, pp. 100. Alfred Guillaume, The Life of Muhammad: A translation of Ibn Ishaq’s Sirat Rasul Allah, Oxford University Press, pp. 107. Gerald Hawting, “Were there prophets in Jahiliyya?”, Islam and its Past: Jahiliyya, Late Antiquity, and the Qur’an, Oxford University Press, pp. 196-197. Gerald Hawting, “Were there prophets in Jahiliyya?”, Islam and its Past: Jahiliyya, Late Antiquity, and the Qur’an, Oxford University Press, pp. 197. Muhammad b. Rizq b. Tarhuni, Sahih Sira al-Nabawiyya, Vol. 2, pp. 428. Gerald Hawting, “Were there prophets in Jahiliyya?”, Islam and its Past: Jahiliyya, Late Antiquity, and the Qur’an, Oxford University Press, pp. 206. David Cook, Studies in Muslim Apocalyptic, Darwin Press, pp. 115. David Cook, Studies in Muslim Apocalyptic, Darwin Press, pp. 111.